Richardson roofing were instructed to span galvanised support work between the steel and concrete to support the panels and reach the architects desired sheeting lines, which was larger than the standard range of Trimo panel supports (almost 300mm). This therefore lead us to designing our own support work. We had to size the angles accordingly in order to provide adequate support. Our design had to take into account the project wind loads as well as designing details that could be easily installed. After our in house design team was finished we employed a structural engineer to check that it would be adequate to support the loads and to advise on the fixing centres. We installed the 172mm Trimo Qbiss on B panels in 4 different module sizes in 2 colours, 3 modules (1200,900 &750) in Ral 9005 and a 600mm wide feature panel in Kronos. The panels that had to span over 5m needed to have a different Core type then specified to be able to span the distance. As well as installing rockwool insulation within the cavity to meet the U-value of 0.14w-m2k. In addition to maintaining the high fire resistivity of the Trimo panels we installed cavity barriers to comply with the fire consultants specification giving 30+60 mins fire rating within the cavity. 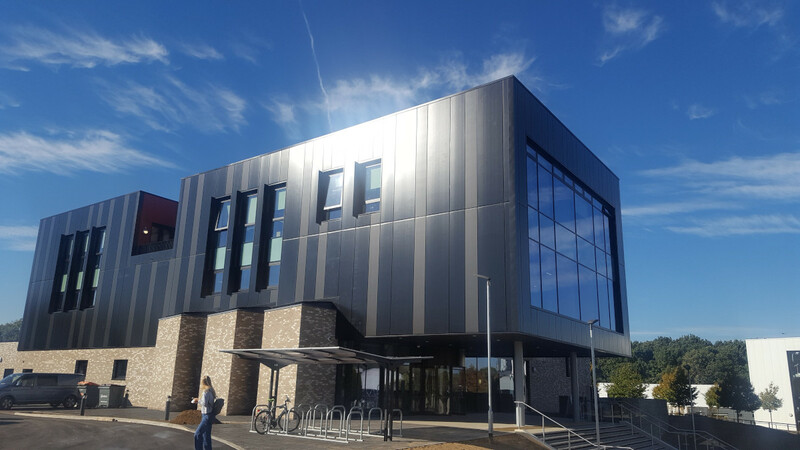 We installed PPC aluminium copings all around the buildings in addition to designing a custom brise soleil next to the Glazing on the south elevation, to provide a slight shade and prevent glare within the internal rooms. 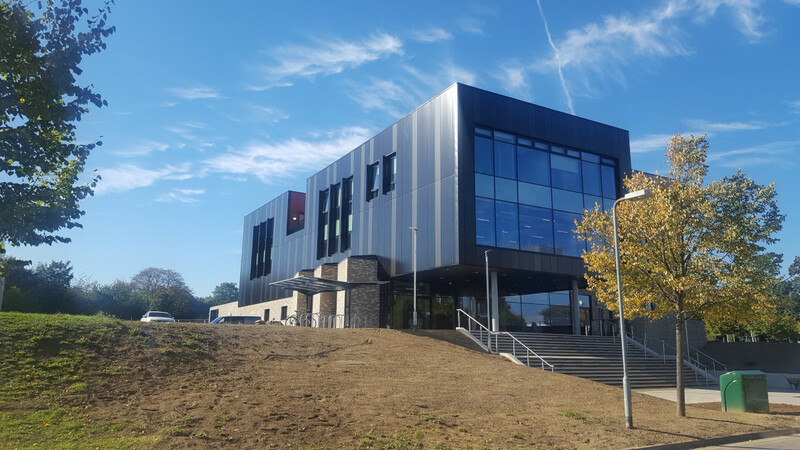 With the south elevation being black and the brise soleil being both aluminium and black thermal movement would differ from panel to brise soleil, therefore measures were taken to ensure this was accounted for. Richardson Roofing clad the south elevation terrace with 12mm Marley eternit Equitone Natura cladding in Agate Red, fixed back to an Nvelope support system. This again was a large zone to cover which required a non-standard system from Nvelope, we worked with the manufacturer to reach the desired set out. The Trimo and Marley cladding were intended to come together within a corner detail to provide a smooth and aesthetic transition. We then undertook a large 3.0mm feature flashing over the terrace fixed over a balustrade which was installed prior to us.